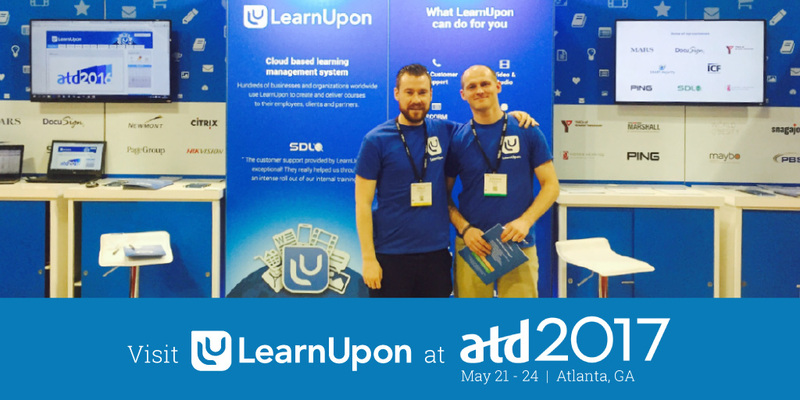 ATD is back and LearnUpon will be there! This year The ATD International Conference & Exposition will be taking place on the 21st -24th of May in Atlanta, GA and with over 10,000 talent development professionals and thought leaders expected to attend, it’s one of the biggest industry events of the year. The LearnUpon team, including CEO Brendan Noud, Inside Sales Manager Caoimhín Gillespie and Account Manager Robert Daly, will be manning our booth (number 1916) from the 22nd to the 24th of May at the expo. With so many great industry leaders in attendance, it’s definitely worth your while visiting the LearnUpon team. We’ll be sharing our knowledge about learning technologies and providing valuable insights into the latest eLearning trends, as well as showing how a great LMS can work for you. We’ll also be on hand to provide live demos of LearnUpon’s LMS, answer any questions you might have or if you want to just grab a coffee and chat, we’ll do that too!